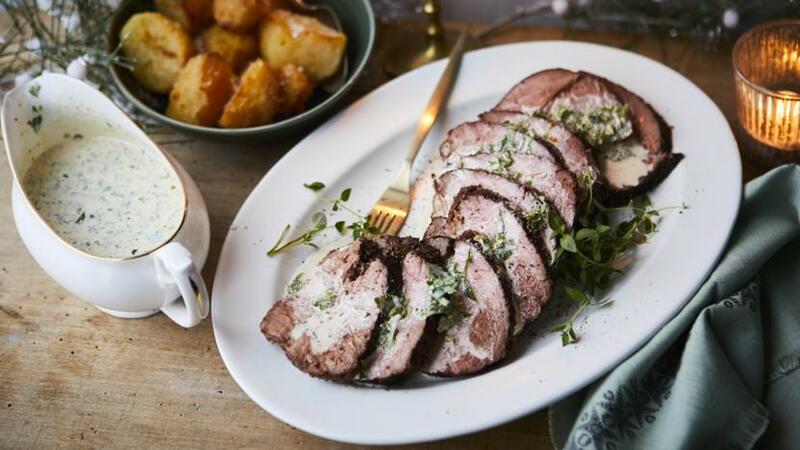 Mary Berry's roast beef is the perfect centrepiece for special occasions and the boozy brandy sauce takes it to the next level. Preheat oven to 220C/200C Fan/Gas 7. Season the beef with salt and pepper and rub the oil over the meat. Scatter an even layer of the cracked pepper and thyme leaves on a board and roll the fillet in the them until lightly coated all over. Heat a frying pan over high heat until very hot. Brown the fillet quickly on all sides. Transfer the fillet to a roasting tin and roast for about 25 minutes for medium rare (8 minutes per 450g/1lb unless it’s a long, thin fillet where it should be 7 mins per 450g/1lb). Pour the brandy into a wide-based pan, bring to the boil and boil for 10 seconds. Add the cream and bring back to the boil, stirring all the time until you have a sauce consistency. Season with salt, then add the herbs and mustard. Any juices from the roasting tin can be added to the sauce before serving. Rest the meat for 10 minutes before carving into thin slices. Serve with the sauce alongside. The joy of this cut of beef is seeing it pink, however, if you slice it more then 30 minutes ahead of serving, the surface of the meat will turn grey, so it's best to carve at the last minute.